Fletch was has been missing since August 2, 2017 in the US Forest Land near Whispering Pines Horse Camp, 3 Sisters Wilderness Area, Oregon. According to Elayne Barclay, owner of Fletch, he was wearing red tack. The search for Fletch has continued since he went missing. However, due to trail closures from the fire in the area which Fletch went missing, search efforts have been affected. If Fletch left the area due to the wildfire, there are closures on both sides of the Pacific Crest Trail. The area that Fletch was tracked has limited to no access based on the fires in the Willamette and Deschutes National Forest. Hunters are facing the same closures as are the searchers for Fletch, with half of the Upper Deschutes Unit closed. Fletch is capable of traveling to surrounding hunt units with trail systems to McKenzie, Metolius, Indigo, Fort Rock or Paulina Hunt Units. If Fletch decided to head for home, he may or may not be heading towards the Grizzly unit. All of these hunt units boarder on the Upper Deschutes Unit. There are varying degrees of difficulty to access without hitting a town somewhere. Domestic equine behavior would suggest that Fletch has had no reason to leave his Oasis. He would not respond to wildfire in the same manner as wildlife. We expect him to be in the unburned areas with no public access at this time. Mrs. Barclay asked Stolen Horse International for assistance in locating their horse. Mrs. Barclay notified the Deschutes County Sheriff Department. The Deschutes National Forest Park Rangers and the Oregon Brand Inspector have been notified of the lost horse. Stolen Horse International, a nonprofit organization also known as NetPosse.com, is well known as the “lost and found’ place for horses on the internet for the equine industry. 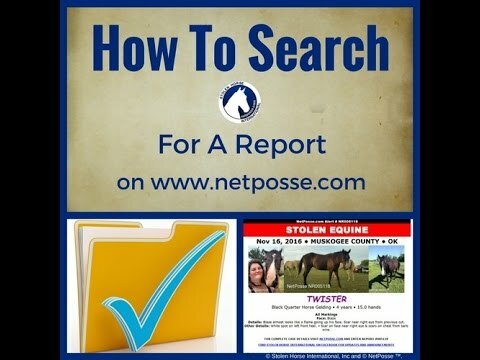 NetPosse.com offers horse theft and equine ID education and assist in search and recovery of stolen or missing horses, as well as other equine equipment. Mrs. Barclay has been working on coordinating search efforts along with the assistance of her friends and the many volunteers at Stolen Horse International. They have contacted Deschutes County Sheriff Department and Deschutes National Forest Park Rangers regarding Fletch. 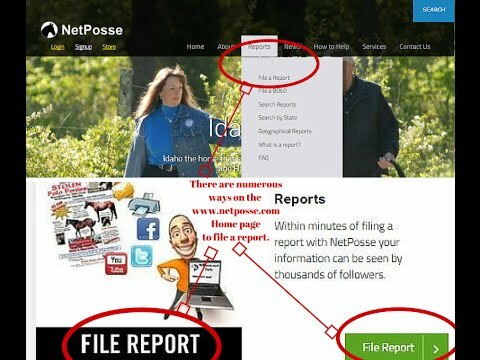 On August 7, 2017, Stolen Horse International, Inc. received the first online report on its web site, www.NetPosse.com, filed by Barclay and, in short order, began distributing the information via their NetPosse Alert (the horse community’s Amber Alert) on the Internet to hundreds of social media groups and private email contacts in an effort to rally the public to help the family. Pictures, flyer, contact information, updates and other information are on the NetPosse webpage to identify this case quickly when calling in a tip. Anyone with information is encouraged to contact Elayne Barclay, Deschutes County Sheriff Department, Deschutes National Forest Park Rangers or Stolen Horse International with any information. © 2017 – Stolen Horse International Public Relations – Pictures are available upon request. For more information on Stolen Horse International and its programs, visit the website at www.netposse.com. Stolen Horse International is a Section 501(c)(3) organization under the Internal Revenue Code. Contributions to it are tax-deductible as charitable contributions. Do you know this Paint horse found in Oregon?